Covering essential principles of anesthesia administration and pain management in small and large animals,Anesthesia and Analgesia for Veterinary Technicians, 5th Edition is completely updated with the latest drugs and techniques. This entry-level practical resource prepares you to properly administer anesthesia with the most up-to-date information on pre-anesthetic preparation of the patient, induction procedures, monitoring animals vital signs during the anesthetic period, and postoperative care. 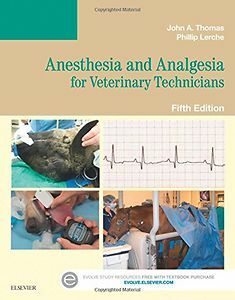 Dive into interesting discussions of actions and side effects of anesthetic agents; the physiology of respiration, heart rate, and blood pressure; emergency response; anesthetic equipment; and specialized techniques - and take a more integrated approach to learning techniques for anesthesia administration with the text's expertly illustrated step-by-step procedures.